Joanna Mills is a tough young Midwesterner determined to learn the truth behind the increasingly terrifying supernatural visions that have been haunting her. 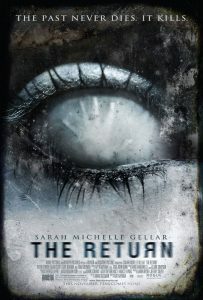 The Return offers a decent storyline that’s bogged down by tedious pacing and stiff performances. It’s disappointing that the studio decided to market this film as a horror movie since it was really a drama with a supernatural hook to it. The first hour is so hard to sit through because the director moved everything at such a crawling pace. It might just be me but listening to the same clues and watching the same flashbacks over and over again does get pretty annoying. The story is literally at a standstill until the one hour mark. When the plot finally reaches its boiling point, it does so far past the point of audience involvement or genuine concern. The characters were not engaging enough for me to care about them and absolutely nothing happened in the first hour so there was very little to actually be interested in. When things start to pick up, the suspense is pretty low and the ending wasn’t really that great. It was something a little different compared to most films that come out these days but it still wasn’t good enough to compensate for everything the audience had to sit through.